Ace Frehley and the rest of KISS famously played one of the first gigs at the Tomorrow Club in 1974, but KISS quickly became too big to ever do another gig in Youngstown. On July 22, 1992, the Space Ace landed in Youngstown once again to do a show at JB’s Lounge. It was the second show of a large several month club tour for Ace and marked the first time in two years that he was out on the road. Frehley was not touring in support of anything at this juncture. His last solo release was in 1989 and he was several years removed from his Frehley’s Comet days. Fittingly it was called the “Just For Fun” tour. Frehley stayed on the road as a solo act consistently for the next four years before the KISS reunion tours began. WHAT THE SHOW SOUNDED LIKE: Here’s Ace and company playing “New York Groove” from a stop on that tour. Below is a link to Tomorrow Club shows from 1974. There were some gaps in the Vindicator record, but it seems pretty complete due to it being only open for roughly two months during that year. Big acts appearing in that time frame include: Bob Seger, KISS, Ted Nugent, Parliament Funkadelic and the Michael Stanley Band. On October 27, 1974, KISS rolled into town five days after releasing the Hotter Than Hell album. The band – comprised of Paul Stanley, Gene Simmons, Peter Criss and Ace Frehley – was on the seventh date of its 55-date tour to support that album. The venue was the old State Theatre on Federal Plaza. By this juncture, the old movie theater was roughly four years removed from its life as a cinema. Renovated and renamed the Tomorrow Club, the theater would showcase some of the best acts from rock, jazz and country for the next decade. KISS was one of the first major acts to be booked there. According to an ad in The Jambar on Oct. 22, 1974, the first preview show at the venue was October 20 with Focus and Gentile Giant. Golden Earring and L.A.W. played on Oct. 23. 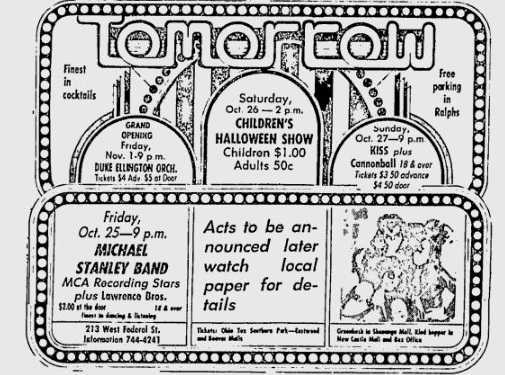 In the Vindicator ad in the week to the run-up of the show, the Michael Stanley Band is listed as playing on Friday. A children’s Halloween show follows on Saturday with KISS and opening act Cannonball on Sunday. The Duke Ellington Orchestra is listed as playing the Grand Opening of the Tomorrow Club on Nov. 1, 1974. KISS was not the band of cartoonish, kid-friendly comic book stars at that point in 1974. The band played with a darker edge and centered its song-writing around the seedier side of life in New York City. The stage show was evolving as more pyrotechnics were added and stage tricks perfected. The setlist was likely composed of: Deuce, Nothin’ to Lose, She, Firehouse, Strutter, 100,000 Years, Let Me Go, Rock and Roll, Cold Gin, Let Me Know, Got to Choose, Watchin’ You and Black Diamond. WHAT THE SHOW SOUNDED LIKE: An excellent soundboard recording of an East Lansing, Michigan show on Oct. 21, 1974 is as close as you’re going to get.